Do you believe in magic? Join us for an enchanting evening at Dogs are Magic, Paws & Think’s 2nd Annual Extravaganza. Tickets are no longer available for this event. However, you don’t need to be present to bid online for the silent auction. 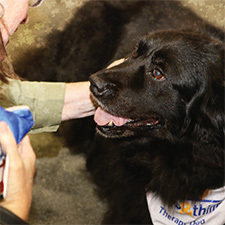 Our goal is to bring together partners and leaders in the community, who are all dog-loving supporters, to raise funds to help improve lives through the power of the human-dog connection. This event will be emceed by Patty Spitler of Great Day TV/PetPalsTV. Ticket price includes wine donated by Fitzmark, passed hor d’ouerves, a delicious dinner, and magically-themed entertainment. Additional activities include a silent auction, dessert dash, wine pull, and more! Come marvel at the magic! If you have any questions, please contact Kelsey Burton at kburton@nullpawsandthink.org.